Most people don't know or forget that the living world does not exist only where we can see it, above ground level. Even if we can't identify them all, we are fully aware of trees and wildebeest, meercats and scorpions, whales and herring, rose bushes and eagles (and all the rest). Beneath our feet is another vastly more complicated world, the SOIL wherein live gigantic populations of breathtaking biodiversity consisting mostly of small to microscopic to invisible to undetectable creatures of all sorts: mites, algae, spiders, viruses, bacteria, eelworms, springtails, water bears, moles, insects, ciliates, amoebae, rotifers, centipedes, flatworms, earthworms, slime moulds and, neither last nor least, fungi. One might say about these that we ignore the immensity of life in below ground level - in the soil - at our peril. Well, that's precisely what we do. When we blithely plough the fields and scatter to make our food, we concurrently destroy entire populations of organisms above and below ground. They get mangled, minced, exposed and desiccated = killed. Then, to grow crops, we have to add the protective and nutritive services (artificial and hazardous pesticides and fertilisers) that they once provided. Had we the knowledge and foresight, they could be recruited to provide those ecological services for our use - gratis. Therefore, before we carelessly wipe out the organisms which enable our planet's biosphere to function, it is essential that we do our best to learn about them and what they do; the majority have yet to be recognised, let alone named, so the ecological roles of most of them are completely unknown. Then we might treat them with the respect due to them and, perhaps, they can be persuaded to work for our benefit. So we at S&LEF (not to mention a relatively small number of scientists around the world) are out to learn a little more about the 'mycorrhizal' soil fungi that collaborate with plants, enabling both to succeed where independently they probably would not. Actually, it's mind-bogglingly more complex than that because interaction occurs between and among all members of ecosystems, gigantic 'internets' of collaboration, sometimes friendly, often not. This project is a collaboration involving Lochalsh pteridologist (ferns etc.) 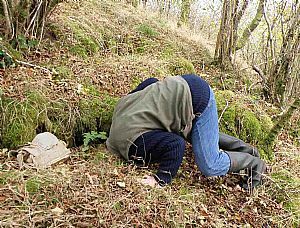 and mycorrhizast (read on) James Merryweather (reporting here) and Skye mammal ecologist Roger Cottis. I used to be a researcher at the University of York's Department of Biology where I used the bluebell Hyacinthoides non-scripta as a 'research tool' to discover the ecological function of the symbiosis arbuscular mycorrhiza (ubiquitous and foundational to all terrestrial ecosystems) which had, until then, been characterised under highly artificial conditions. It was my supervisor Prof. Alastair Fitter's vision that we would learn more from field work than in the lab., even if it would be many times more challenging: ecological research is notoriously difficult to interpret because there are so many unexpected variables to mask your results. When I went to the US in 1993, attending the Ecological Society of America conference at Madison Wisconsin, there was a poster next to mine by Renee Mullen showing very similar new/unique results from a project like mine working on an alpine buttercup Ranunculus adoneus growing in the mountains of Colorado (read the paper). These two projects were the first to show that phosphorous uptake was actively mediated by mycorrhizal fungi, already known from pot experiments, but now - importantly - confirmed under field conditions. The York work took place at a single field site, Pretty Wood, Castle Howard and we very much wanted to know whether bluebells had the same symbiotic fungi at other sites. At that point I took early retirement and that apparently simple question remained unanswered. 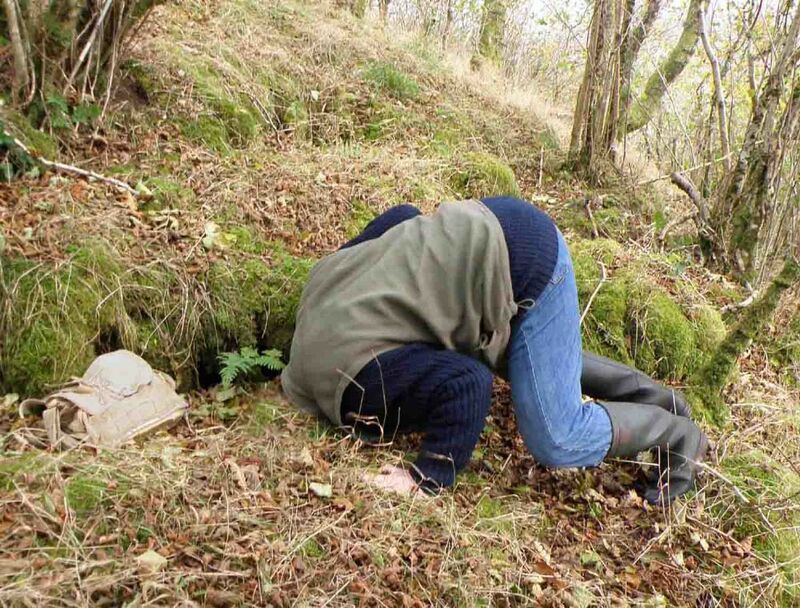 Recently (10 years later) Alastair has taken on an Italian post-graduate student Michele 'Mike' Pigniataro (project: 'Are mycorrhizal communities predictable?') to look for the answer using bang up-to-date molecular (DNA profiling) methods. 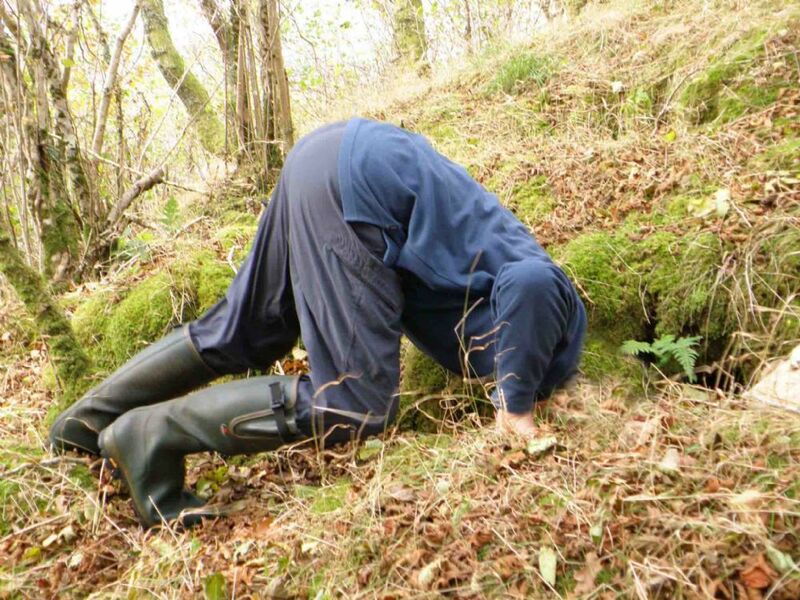 He travels the length and breadth of Britain, sampling bluebell roots and sequencing regions of their DNA specific to arbuscular mycorrhizal fungi of the phylum Glomeromycota (aka Glomales, species of Glomus, Acaulospora, Scutellospora and Gigaspora). Mike's sci-fi wizardry is beyond us, lacking the academic and practical skills, the equipment and the money! 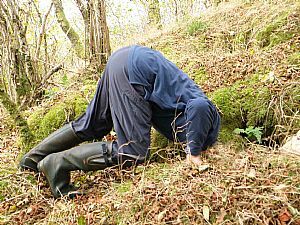 However, Roger and I decided to team up and carry out a more traditional biological investigation ourselves, taking advantage of my experience and Roger's bluebells in his birch/hazel woodland at Isleornsay on the Isle of Skye. We lift the bluebells and remove ~ten roots and pop the bluebells back. They'll get a hit from the disturbance, but will soon recover. Then we go to the University of York's Skye & Lochalsh Field Station (my glorified garden shed) to stain the roots to show up the fungi therein and examine them under the microscope, quantifying % root length colonised and taxonomic diversity mycorrhizal fungi. We have just taken delivery of a second-hand bench centrifuge, so we can also sample bluebell root soil for mycorrhizal fungal (zygo)spores, which are highly characteristic of each species, so they will add information to the rather tricky characterisation of the bluebell's symbiotic fungal diversity. There's a lot more to this project. Maybe to you they sound boring, but when they're your own the stained roots are fascinating and the spores are that too as well as beautiful. Some of them are enormous, bigger than 500 micrometres, that's half a millimetre plus in diameter, and they glisten in glorious colours. My second best favourites are the golden, honey-coloured Acaulospora species A. laevis, A. koskei ('Little Honey') and one I found at Pretty Wood in fair numbers a few times which had no name - quite likely new to science and, as yet, undescribed - which were huge, named 'BIG Honey'. My all-time favourite is Scutellospora dipurpurescens, bluebell's main fungal partner, about which I will write ecstatically another day. I have pictures, but they don't show S.d. or 'Scute' off to best advantage, so I'll wait until we gather some fresh specimens in Roger's wood (I feel confident it will be there).